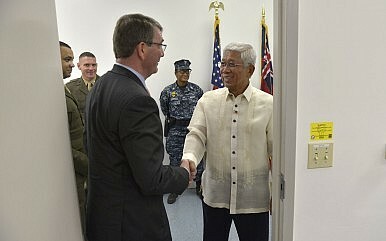 Secretary of Defense Ash Carter welcomes Philippine Defense Minister Voltaire Gazmin to a meeting after attending change-of-command ceremonies for U.S. Pacific Command and U.S. Pacific Fleet in Honolulu, Hawaii, May 27, 2015. Philippine officials renew their attack on China’s alleged aggression in disputed waters. Over the weekend, the Philippine Department of National Defense once more attacked China’s purported aggression in the South China Sea, calling Beijing’s announcement that it is committed to peace “deceitful rhetoric,” according to AFP. “The Chinese leadership should go beyond deceitful rhetoric claiming peaceful efforts before their aggression takes a greater and irreparable toll on the region and beyond,” Peter Paul Galvez, a defense department spokesman stated in a statement last Sunday. China has pushed its territorial claims in the South China Sea vis-à-vis the Philippines with vehemence. Among other things, Beijing has seized Scarborough Shoal – a shoal located between the Macclesfield Bank and Luzon island that is claimed by China, Taiwan, and the Philippines – from Manila in 2012 and continues to prevent the latter from carrying out oil and gas explorations in what the Philippines consider its territorial waters. A recent survey conducted by the Pew Research Center shows that 91 percent of Filipinos are concerned over territorial disputes with China in the South China Sea – the highest percentage among all countries surveyed in this April/May 2015 poll of 15,313 people in ten Asia-Pacific nations and the United States. As I noted in August, (See: “Philippines Push For Military Modernization in New Budget Proposal”), Manila is planning a 25 percent increase in the a portion of its 2016 defense budget dedicated to the modernization of the Armed Forces of the Philippines (AFP) in order to reinforce its military assets in the South China Sea. In detail, the 2016 funds will be used to purchase two frigates, two twin-engine long range patrol aircraft, three aerial surveillance radars, and the first two out of a total of 12 FA50 light fighter jets ordered from South Korea. Philippine Defense Secretary Voltaire Gazmin has also recently requested military assistance from the head of U.S. Pacific Command, Admiral Harry Harris Jr., to strengthen the Philippines’ position in the South China Sea by assisting in monitoring the situation in the disputed waters in “real-time” through providing surveillance and reconnaissance assets, as well as air cover to a civilian ship that supplies military personnel stationed on and around the Second Thomas Shoal.